if you guys remember, back in october I talked about putting together a capsule wardrobe. it’s march now, so an update is overdue. in short, it’s a work in progress. I have had a capsule wardrobe that I’ve used heavily in the past 4 months. most of the items that made the cut were winners – I was glad I picked them, and I wore them on a regular basis. some items weren’t as successful, for various reasons. either they didn’t fit the way I liked; they were similar to other things that I liked better (hello, striped shirts); they weren’t sufficiently warm for the season but I didn’t have an appropriate replacement; or they didn’t fit my lifestyle as much as I thought they would. buoyed by Caroline’s positivity, I took these misses in stride and decided to find the lesson in them (“I didn’t use this shirt as much as I thought I would…how interesting. why didn’t I?”). someday I’ll be a capsule wardrobe master, but right now, I’m still learning the art of curating one, and that’s ok. it’s fun, and I’m learning a lot about myself and my relationship with the things I own. but there were successes, too! I really got to pin down all the things I do love. some of it was a confirmation of what I already knew (I really love neutrals, grey in particular), while some of it surprised me about myself (discovering that I’m drawn to bold prints). note: each piece represents a category (e.g., short-sleeve shirt, black jeans). I may have had more than one shirt/sweater/cardigan/jean, and the pieces shown may not be exactly the ones I have if I couldn’t find the exact picture. you know how you end up packing for a trip & along with the basics, you throw in some “in case” outfits for when you might need to look extra cute…and then you never touch those things & wear your basics over & over? yeah. that’s what happened to me with this capsule wardrobe. I forgot (or conveniently chose to forget) that fall lasts about 5 minutes in Chicago and the rest of the time, it’ll be cold, wet, & grey, and that when things are cold, wet, & grey, I want to be warm & comfortable above anything else. 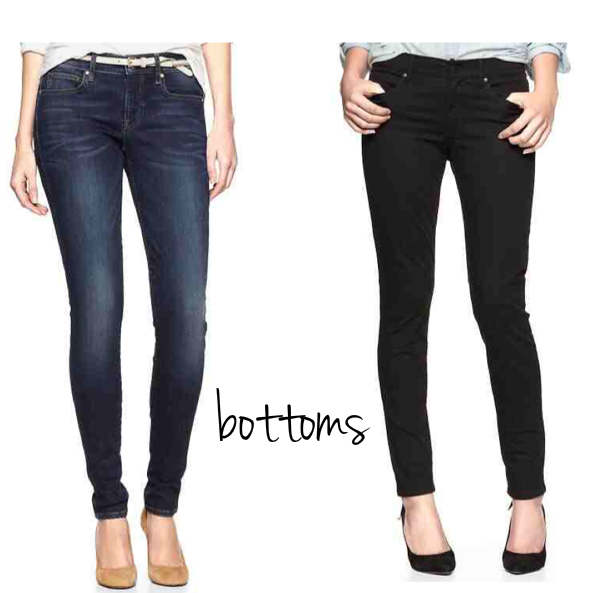 this is why all the cute skirts I included in my closet aren’t in the “bottoms” collage. I wore jeans, either dark blue or black, for 90% of the time. 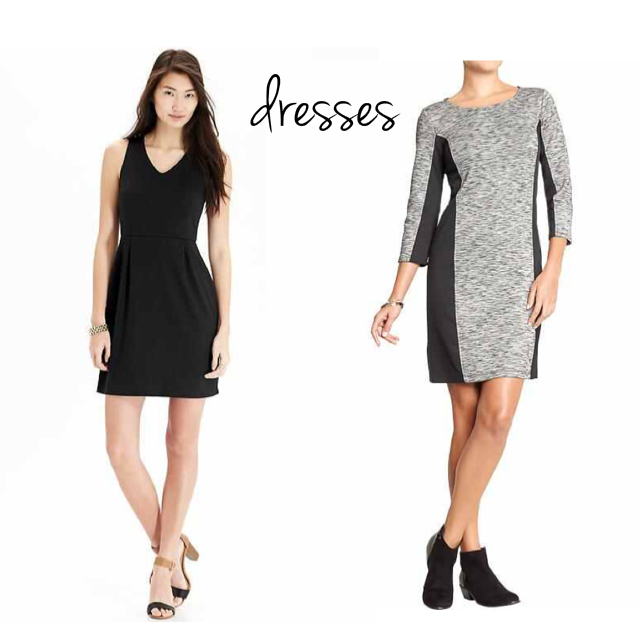 the other 10% of the time, I wore easy knit dresses in black, grey, or a combination of the two (the sleeveless one I wore with a turtleneck under). 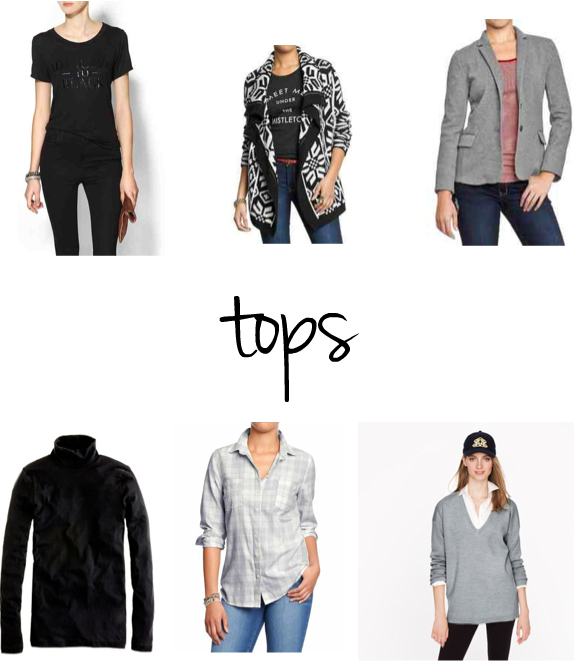 for tops, I either wore a sweater or a flannel button-down (with a layer underneath for added warmth if necessary), or a shirt with a cardigan or a blazer layered on top. 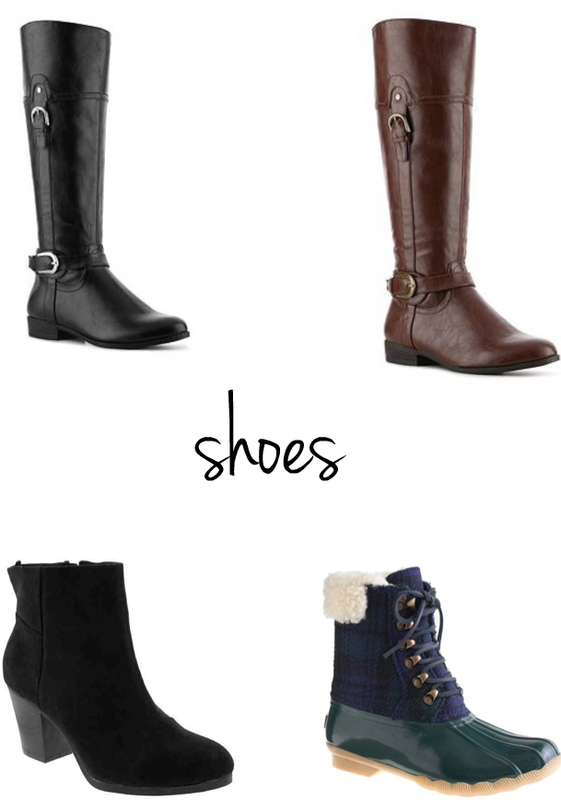 as for shoes, I pretty much only wore boots, even back in the fall, rotating between duck boots for the really wet days, riding boots for cold, dry days, or faux suede ankle boots for semi-warm, dry days. looking back on it, it all seems kind of boring, but that’s just how it all played out. I see pictures of women who manage to look amazing in the winter with such interesting outfits, and while I give them props & find myself inspired, I now know that that’s not me right now. oh, I know I’ll find some creative outfit to put together every now & then in the winter when I feel the need to break the monotony, but this capsule wardrobe, as flawed as it was, made me realize that when it’s cold outside, I go back time & time again to an easy (albeit slightly boring) uniform. besides, an easy uniform is the perfect backdrop for accessories. keeping all of this in mind, I’m now planning my spring wardrobe. I’m drawing up an inspiration board & thinking of all the things that come to mind when I think about my life for the next three months & how I want to dress for it. 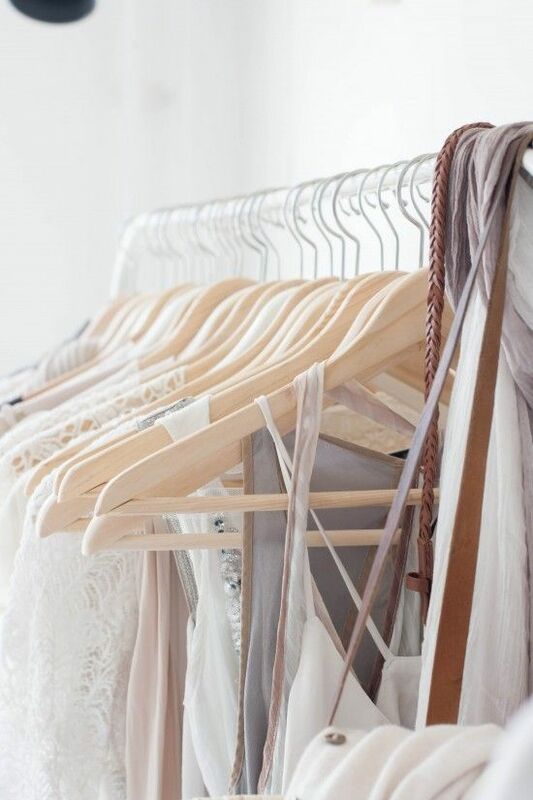 I’ll post my inspiration board next week, and I hope to have my spring capsule wardrobe ready to go by the last full week of march, just in time for spring!